A wood porch serves as an outdoor living space that also adds visual appeal to your home's exterior. Unlike indoor rooms, however, your porch is exposed to the residue of recurring rainfall, falling leaves, and windblown dirt. But even if your wood porch becomes especially soiled, you can safely clean it up with oxygen bleach and a little elbow grease. 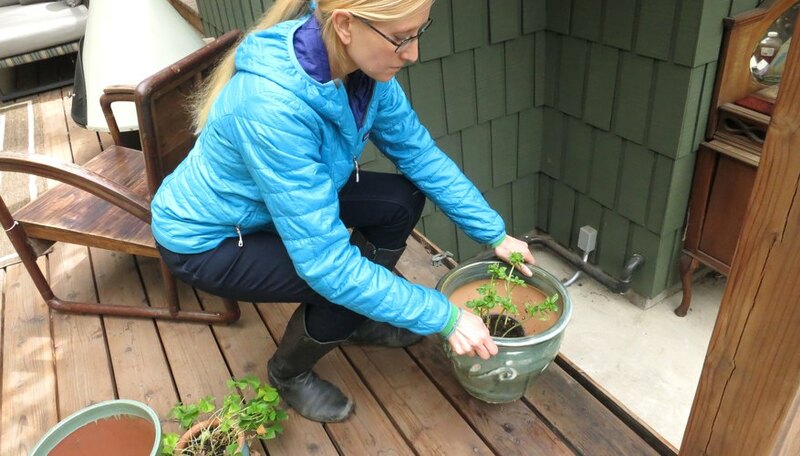 Remove any furniture, planters or other items from the porch. Mix 1 tablespoon of liquid dish soap with 1 cup of very hot water. Dip a scrub brush into the mixture and scrub away any grease spots on the porch, such as those around an outdoor grill or barbecue. 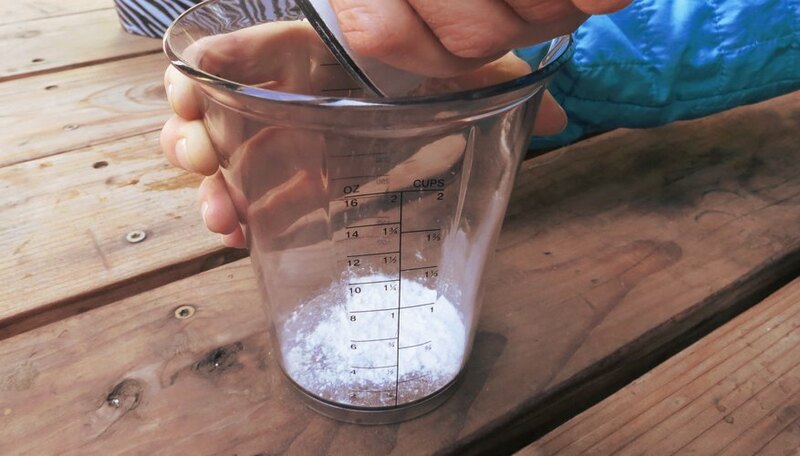 Mix 2 1/4 cups of oxygen bleach powder with 3 gallons of warm water in a large bucket. 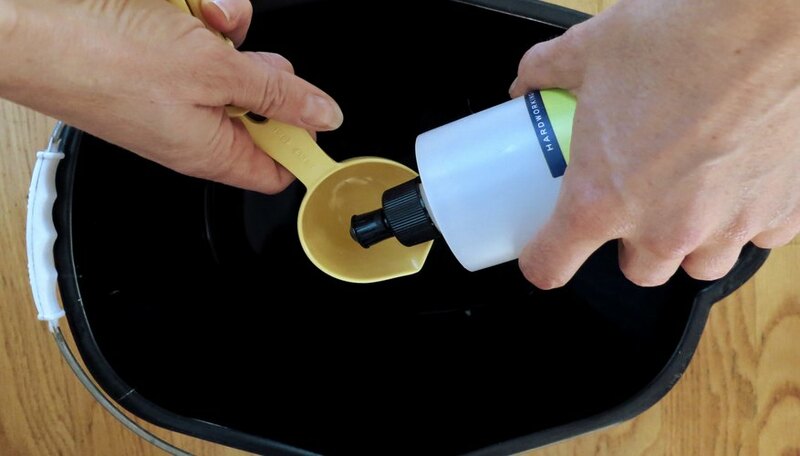 Wait approximately five minutes for the powder to completely dissolve in the water; you can expedite this by stirring the mixture with a clean toilet brush. 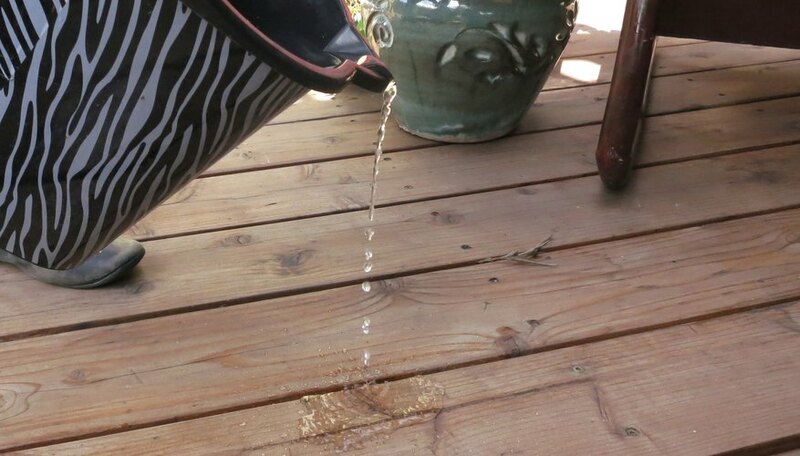 Pour some of the oxygen bleach mixture directly onto your wood porch; it will begin to bubble and foam on the wood. 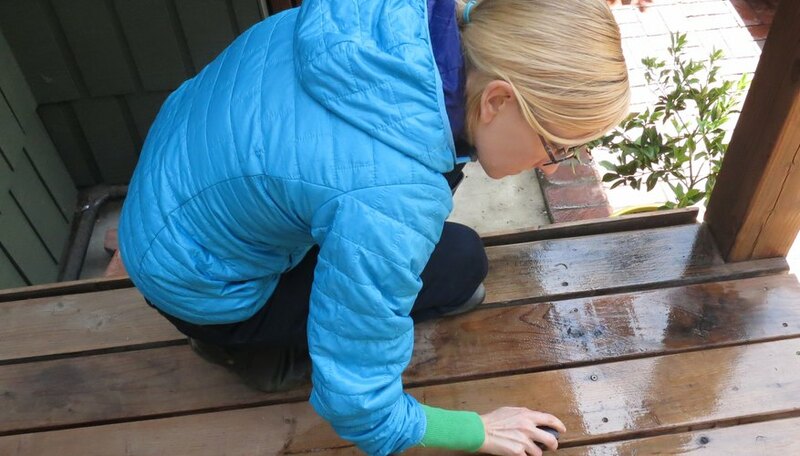 If you have a large porch, work in sections so you don’t have to scrub down the entire porch floor at once. Let the oxygen bleach work on the section of wood for approximately 15 minutes, then begin scrubbing lightly with a long-handled scrub brush. Repeat with the other sections of the porch until the entire surface is cleaned. Mix up a new batch of oxygen bleach. 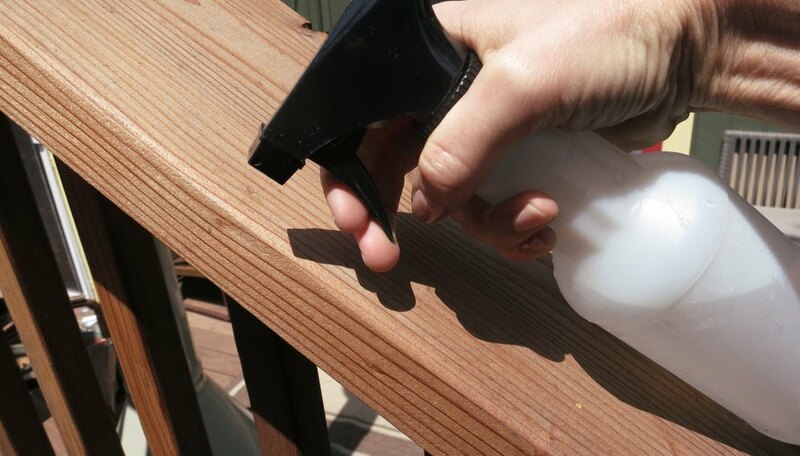 Pour it into a hand pump sprayer, then spray all of the porch’s railings. After 10 minutes, gently scrub the railings with a scrub brush or clean toilet brush. Rinse the entire porch by spraying it down with a garden hose. 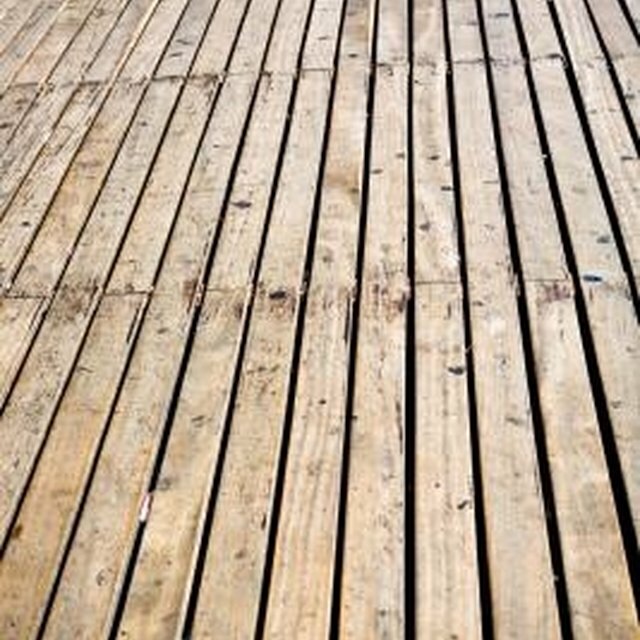 Do not use a pressure washer, which can cause the wood to split or fray if you use it improperly. Oxygen bleach is not toxic or harmful to plants, so you can safely rinse it off the porch and onto the ground with the garden hose.